My Ducati Supersport S has been asked to perform more on the sporty side. Short back-road blasts and a Donington Park trackday certainly saw it earn its sporting stripes. But now it’s time to see if it can cover decent miles in relative comfort (we’ll leave the ham sandwich for now)? Ducati have never claimed this is a Yamaha FJR replacement or even a Honda VFR800 rival (although many have made that comparison), describing it simply as a sportsbike for the road. The implication is that this bike is capable of anything. If you really want to cover thousands of miles every year and cross Europe in complete comfort, buy a BMW R1200RT. If you want to win the fast group at a track day, buy a Ducati Superleggera. 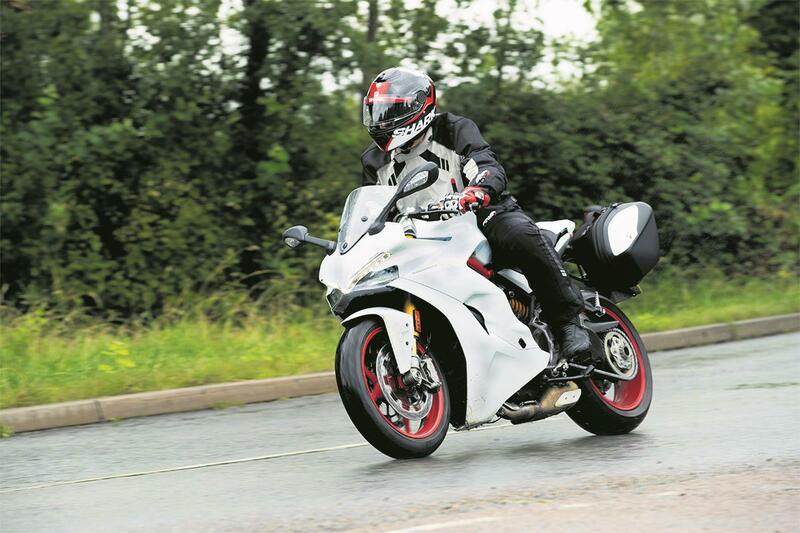 The Supersport needs to be good enough at those extremes of the scale, providing style and versatility along the way. While the SuperSport S does err on the sporty side – I have also found the adjustable screen effective and the riding position comfortable-ish. But it will soon face a stern test of its touring credentials. I’m planning a week-long trip to the Orkney Islands. Leaving a couple of days in the middle of the trip to walk around a bit, the bike’s all-round abilities will be put to the toughest of tests. Big motorway mileage, scratchy Scottish mountain roads and two 600-mile plus days in the saddle should reveal a lot. So it had better be a lovely saddle. I’ve made a couple of key purchases to make this long-distance mission enjoyable and not just an endurance test. I’ve fitted Ducati’s Comfort Seat (£212), a set of Ducati side panniers (£960) and a tank bag (£180). I’ve also treated the bike to a set of Akrapovic silencers (£853) – which sharpen up the look. The standard seat is okay, but I’ve noticed the sidepanels digging into my legs after an hour or so in the saddle and the new seat’s extra padding is immediately noticeable. So much so, that initially I felt raised-up. As the seat gives a little and I get used to it, I reckon this will be money well spent. 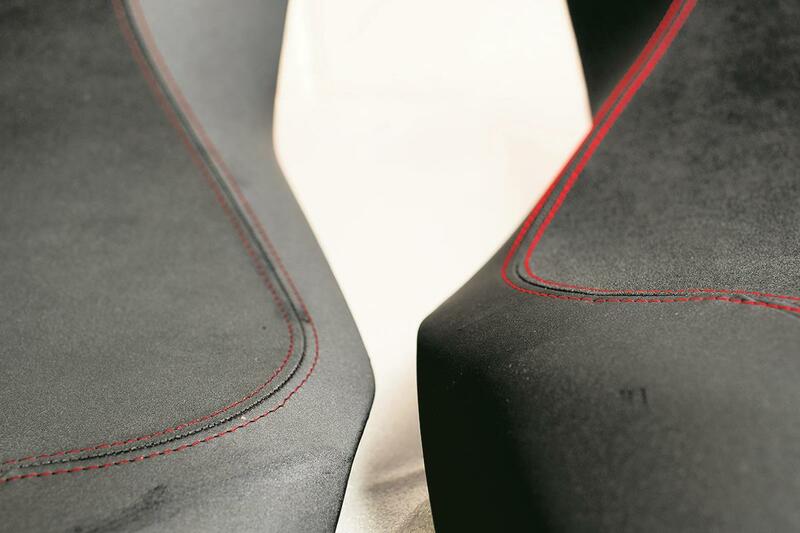 And you don’t even have to lose the neat-looking seat cowl. The Ducati panniers are expensive, but add stylish practicality. Each bag is 25 litres (when expanded to their limit) and while you won’t get the kitchen sink in, I should be able to stash enough kit for a week way. Although I’ve also got Ducati’s magnetic tankbag (£180) on order to add a bit more carrying capacity. The panniers require a small mounting rack, which took about half-an-hour to fit, and the panniers clip on and off in seconds and can be locked in place. The right-hand pannier has a heat guard underneath to stop the bag from melting, although it’ll be interesting to see if the waterproof outer covers survive – it has so far. The pillion pegs remain in place. There are cheaper tankbags, but the official Ducati item gives me some confidence that it will fit properly, work properly and last for a good few years. There’s nothing worse than getting an ill-fitting tank bag that you have to hold in place with your knees, or elbows or both. And poor quality bags can easily damage your tank. The Akrapovic cans were a bit fiddly to fit so I called on a Ducati mechanic to help. There’s no need to mess around with the fuelling and, to be honest, they don’t make a huge difference to the bike – just a bit of style. I didn’t want to turn the Supersport into an out-and-out tourer, just give it a dash of practicality and I think these mods do that. I can’t wait to head for the hills.